Arrow: Who Is Cayden James? After a little hiatus, Arrow has returned. I have to admit, though, this episode left me feeling a little like Homer after he joins the Movementarians and they show him the brainwashing video. Maybe the gap between episodes kind of threw me, but I found myself a bit confused at points tonight. I absolutely loved the intro with the arcade scene. I was hoping that the whole episode would be about the team making their way through a booby trapped arcade/funhouse set up by Prometheus. That would have made for an action-packed night! I was drawn in with the elevator scene and really dug the Airplane movie reference from Curtis, too. Very nice! I think where things got a little muddled for me was when the episode started veering into the A.R.G.U.S., Helix (the key they wanted and ended up duplicating), Felicity, Cayden James, Lyla, etc. realm. It felt a bit jumbled to me with all the storylines sort of colliding. So, what exactly is the deal here? Ollie doesn’t want Felicity working with Helix to find Prometheus because he doesn’t want her to “destroy her soul” and morals for something he created? But…hasn’t she sort of already done that by standing with him over the years while he’s done some pretty bad things himself? When she called him out tonight, I had to agree with her. As far as I can see, Helix hasn’t done anything different than what Ollie and his team has done over the years—illegally hacking into everything, using force, killing, etc. Sort of feels like the pot calling the kettle black, no? Oddly enough, the points I brought up above are one of the reasons I like the show. It makes me think. 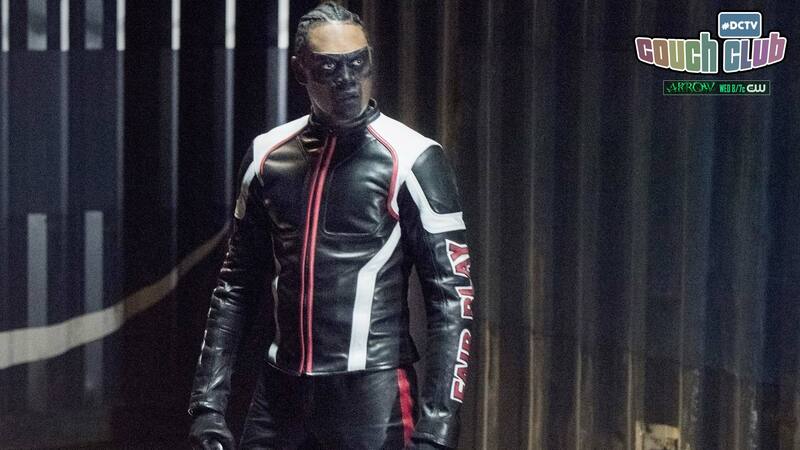 The Arrow team has done a good job of injecting some interesting angles these past few episodes—exploring Ollie’s past and growing his character through the realization that his actions may in fact have been wrong. Tonight’s episode had those same elements with Ollie and Felicity’s interactions. In fact, this was probably the strongest aspect of the episode in my opinion. The writers relied on the element of mystery with Cayden and that always leads to a lot of intrigue and excitement for the viewer. Think about Pulp Fiction—particularly Harvey Keitel’s character, The Wolf. Before you ever actually see him, you hear other characters talking about and referring to him. You haven’t been introduced to him on screen yet, but you understand that there’s something special or cool about him and your brain starts to churn—creating an idea of who this character is, what he looks like, etc. It gets to the point where you just can’t wait to see the character and see what he’s all about. There are similar examples of this all over comics, TV and movies. Tonight gave me that same feeling when Lyla and Helix kept hinting at Cayden and his mysterious past. They took it one step further in the scene where Felicity aids Helix in busting him out of where he’s being held captive. Just when you think you’re going to see who this guy is and what he’s all about, the writers swerve you, as there’s a cover over his head and he seems to be unconscious. So you never truly get to see him or what he can do, but you know that he’ll make an appearance at some point (hopefully soon) and that spurs you on and gives you something to look forward to. So now that Helix tossed Felicity to the curb after getting what they needed, they just split? No way. I don’t buy it. They built that faction up too much this season to just have it end like that. I think we’ll see more of them real soon and maybe they’re setting up this Cayden guy to be the next villain for Oliver and company. With only a few episodes left and tonight’s ending with a bang (literally), I can’t wait to see how things conclude and what they set up for the future! Matt Ross covers Arrow as a part of the #DCTV Couch Club. Catch new episodes of Arrow Tuesdays at 8 p.m. (7 p.m. CST) on The CW. Arrow: No Shoes. No Shirt. No Kill.